As you evaluate the two solutions, it’s important that you have not only a big-picture understanding of the differences between the two platforms but also an understanding of the nuances between their feature sets. Only then can you evaluate whether a particular solution is the best fit for your current business needs. On the surface, HubSpot and Pardot might look like extremely similar platforms. 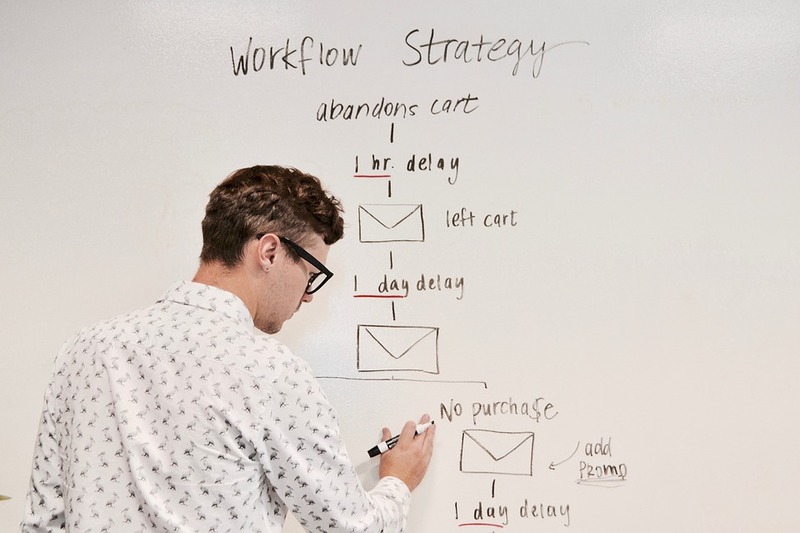 They are both wide-sweeping marketing automation platforms that have a foot in every aspect of your operation, but there are some key differences that set the two apart. The first thing that you have to understand about the two platforms is that while they might look very similar on a superficial level, they focus on two different areas. HubSpot strives to be a complete marketing and sales platform, connecting every aspect of your marketing and sales operations together in one simple overarching solution. Pardot, on the other hand, focuses much more on automation, particularly as it applies to email. Their single-channel focus makes them a great fit for companies that want to focus their efforts heavily on email automation but less of a fit for companies that want a more comprehensive digital marketing solution. Pardot’s main focus is on lead generation and nurturing. Both HubSpot and Pardot offer email automation features. In fact, HubSpot’s email marketing features may even surpass Pardot’s (a solution that focuses on email marketing and automation) because of their in-depth reporting and responsive templates. HubSpot also has a huge marketplace for templates available to subscribers, giving users access to a wide range of resources that they can use to bolster their campaigns. For companies that want a more well-rounded approach to email marketing, we recommend HubSpot. 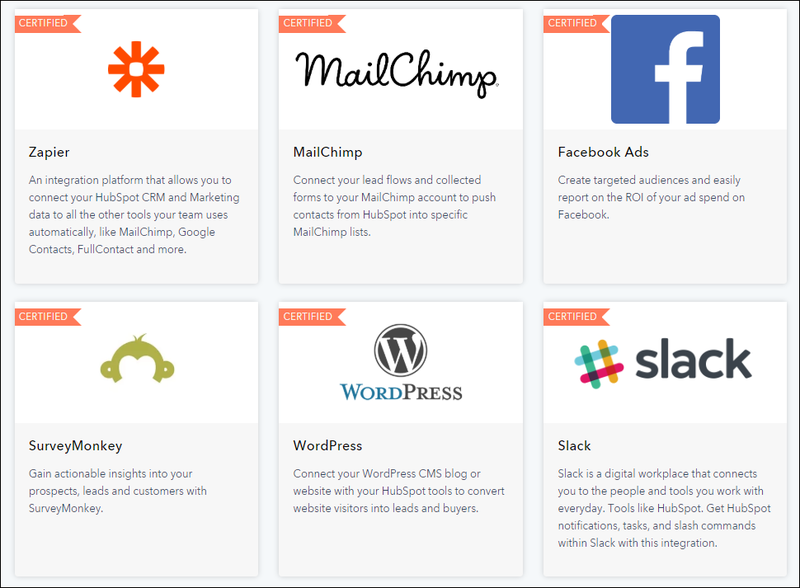 HubSpot’s platform includes a lot more resources for top-of-the-funnel marketing activities. Because lead generation is where a lot of our clients tend to need help, it makes more sense for us to use a solution that provides resources that directly aid our lead generation strategies. HubSpot includes a number of tools including a complete blogging platform, landing page creation tools, content management systems, SEO management, call-to-action builder, and detailed built-in analytics for analyzing top-of-the-funnel activities among prospects. Pardot doesn’t focus nearly as much on top-of-the-funnel activities. While they do offer a landing page tool, they don’t offer SEO management features, call-to-action resources, and requires the use of a separate system for tracking and monitoring KPIs and analytics for those activities. HubSpot tends to be the more well-rounded solution, with features that are geared to aid marketing teams in all marketing activities and at all points in the funnel. Pardot tends to be the right solution for companies that are more narrowly interested in in-depth automation features. Pardot has robust automation rules and the ability to pull more information from Salesforce than HubSpot. On the whole HubSpot offers a more robust solution. Their landing page and form builders are an improvement over Pardot’s, where many of our clients end up using third-party solutions to handle those aspects of their strategy. HubSpot aims to make a marketers life easier by integrating all touch points into a single unified view within their system. According to their Integrations Library, the company currently has 236 different integration opportunities. Additionally, HubSpot also has an open API. If you have the development resources, you can integrate nearly anything with HubSpot. The platform also syncs directly with Salesforce, allowing for constant updates with new CRM data. Pardot has fewer integration options, but the Salesforce system as a whole has an extremely effective ecosystem in their AppExchange. Pardot integrates directly with Salesforce to consistently sync your CRM data, just like HubSpot. Salesforce has a bad track record for integrating solutions into their baseline packages, so it remains to be seen if we will ever see full support for Pardot. It likely depends on the popularity of the platform, but even that looks grim now that Pardot has been cordoned off to salesforce’s more expensive packages. This is a big deal. Much bigger than most companies realize while they are still in the “evaluation” stage. A feature being included in a solution is only helpful if you are actually able to make use of the feature. What happens when you run into an issue or find yourself unable to get a specific part of your solution working? Support and documentation is a clear area where we see a big difference between the two platforms. HubSpot goes above and beyond to offer full support through multiple channels to every customer, with no priority service for higher paying customers. Additionally, HubSpot has invested a lot of time into building out their support documentation to make sure that their customers always have resources that they can turn to with nearly any problem inside the platform. HubSpot offers full unmetered support through phone, web, and Twitter. This goes for every paying customer, even those that subscribe to their smallest packages. HubSpot’s technical support is excellent and on many occasions have helped our clients (and us) to implement portions of their platform that we were unfamiliar with. Pardot requires that you subscribe to their Advanced package (at $4,000 per month) to receive phone support. That’s a pretty costly investment just to receive some help over the phone. While they do offer traditional ticket-based support to all paying customers, their approach certainly leaves something to be desired. HubSpot has more than 1,500 articles and 20 user guides in their Knowledge Base. HubSpot has extensive help guides available in their Knowledge Base and more strategy-focused help in their Academy, where they offer a wide range of courses and guides on marketing and sales topics. Pardot has 300+ articles in their Knowledge Base. While Pardot does have a healthy amount of support content available to their users, it is substantially less than what HubSpot offers. Still, Pardot has helpful articles and guides for solving most common issues with their platform. Pardot doesn’t have bad support. It’s pretty solid. HubSpot just has top-tier support that spans across all of their paying customers. This is one of the bigger reasons why we consistently recommend that our clients use HubSpot — we always know that we are going to be able to find an answer to our problems. Lessons. Lessons typically consist of a series of short videos and articles and take, on average, between 10 and 25 minutes to complete. Lessons typically deal with specific marketing or sales tasks and how they apply to the HubSpot platform. Courses. Courses cover larger topics like inbound marketing, social media marketing, and search engine optimization. Courses are more in-depth and feature videos that take an average of 1-3 hours to complete, with some running a bit longer or shorter depending on the subject. Certifications. HubSpot also offers a number of certifications that you can use to show your knowledge on particular subjects. Some of the certifications include inbound marketing, search engine optimization, email marketing, and sales enablement, among others. These are a great way for companies to ensure that their internal teams are up-to-date with the latest technologies, or for smaller teams to display their competency to clients. Live training. Hubspot offers a few different solutions for live training. They offer self-paced learning in the form of on-demand videos of previous webinars and typically run at least one webinar per week. Other interactive options include Live Labs, which are led by inbound experts that feature example use cases and issues from other HubSpot customers. Quick answers. A frequently asked questions section that provides simple answers to common questions that users have across a wide variety of subjects. HubSpot really goes above and beyond the competition when it comes to training and content creation. Their platform not only allows companies to manage their complete marketing operation but also provides the training necessary to keep their teams up to date and effective. 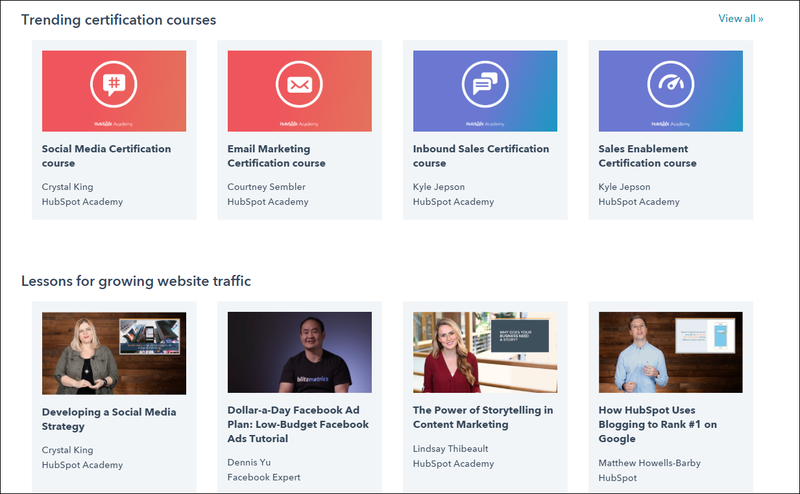 While HubSpot might have a really impressive library of training resources for their customers, Pardot does a fairly good job as well. While their selection is not nearly as deep as HubSpot’s, they do have some training materials available to help companies improve their strategies and usage of their platform. eLearning modules. Specifically designed for teaching users how to use specific features within the Pardot system. A good way to supplement your onboarding learning as you start to implement Pardot. Webinars and videos. Both live and on-demand after they finish. Pardot currently has eight webinars to check out, along with 22 different videos that explain concepts specific to the Pardot system and larger marketing strategies. Downloadable content. This content includes eBooks, white papers, and resources. 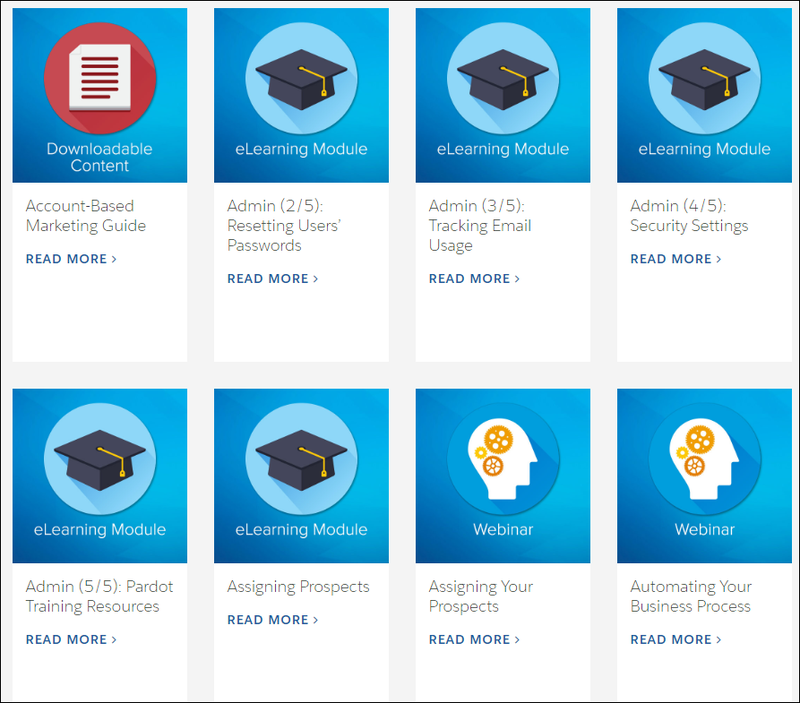 There are 48 pieces of downloadable content in total in the Pardot system. While Pardot does make quite a few training materials available, their selection does pale in comparison to HubSpot’s. This is a big reason why we recommend HubSpot to our own clients — it gives them a better opportunity for self-driven learning. You shouldn't just take our word for it. Both HubSpot and Pardot are highly regarded by marketers and users and generally receive amazing reviews in official publications and from the customers that use the solutions. Understanding how the industry feels about a particular solution is an important step in the evaluation process. HubSpot is the #1 rated solution on G2Crowd. Pardot is #4. Both platforms have received high ratings on G2 Crowd, a business software directory and review platform. Their ratings are based on the company’s G2 Score, which is an algorithm that uses reviews from their users, and data aggregated from online sources and social networks to rank software solutions in a variety of different categories. In terms of popularity on G2 Crowd, HubSpot is ranked #1, while Pardot is ranked #3. HubSpot ranked #1 by VentureBeat. HubSpot was ranked the #1 solution in marketing automation by VentureBeat in the company’s annual index. Salesforce, the mother company of Pardot, is ranked #2 in their index. VentureBeat used survey responses from more than 1,000 marketers to rank the solutions. HubSpot is higher ranked on Salesforce’s own AppExchange. The AppExchange system, where Salesforce allows their users to buy integrations with other solutions has HubSpot rated more highly than the system they actually own, Pardot. HubSpot has 377 5-star reviews on the platform, while Pardot has 93. While both perform well with users and critics alike, HubSpot consistently shows up higher than Pardot on most marketing automation solution rankings. 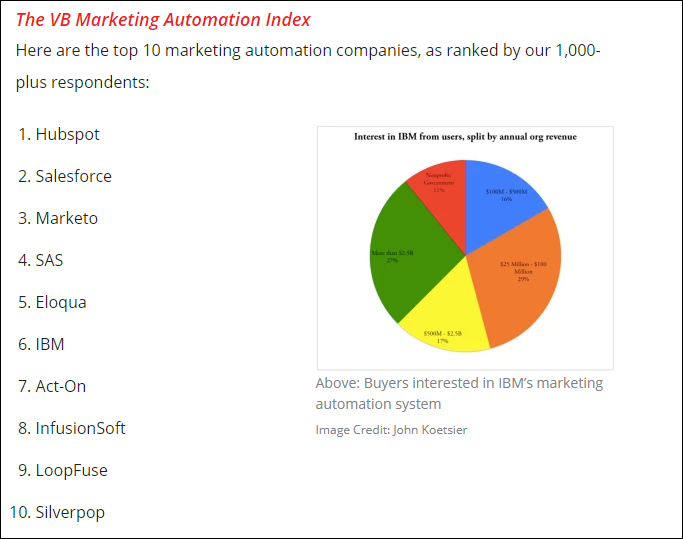 Choosing what marketing automation platform you would like to use and integrate with Salesforce is an important choice. It will dictate marketing and sales processes within your company for the foreseeable future, and it is critical that you choose the solution that makes the most sense for your situation. Here at OpGen Media, as a certified HubSpot Agency Partner, we typically recommend that our clients go with HubSpot unless Pardot is a seriously good fit for a particular client. HubSpot simply provides better coverage of your marketing operations as a whole while bringing more integrations to the table that allow you to further expand that reach. This, combined with the world-class support that they offer simply makes them a better choice for most companies.